Last week, I gave four presentations at Internet Librarian 2014. As usual, it was a really useful conference, full of takeaways for me. Web Trends to Watch in 2015: web design trends to watch for, think about, and maybe adapt (included in this post). Emerging Technology Trends in Libraries for 2015: 10 emerging technology trends, and how they might affect libraries. This was a three hour pre-conference session. Make your Website UX ROCK: All about basic website UX improvements. Five Firsts of Website Strategy: This one was presented at the Library Leaders Digital Strategy Summit, which ran concurrently to Internet Librarian. Fun time! I prepared slides, and then the format changed at the last minute. So instead of slides, I gave short table talks about my topic. Much fun and some good discussion happened. On Friday, I was gettingÂ ready to fly to Monterey, CA for Internet Librarian 2014, and needed to pay for something on my flight with American Airlines. The screenshot above is the credit card payment page on American Airline’s website. It’s weird. Instead of running your name, address, etc left to right, they run everything up to down. So my name? There are three vertical boxes for first, middle initial, and last. 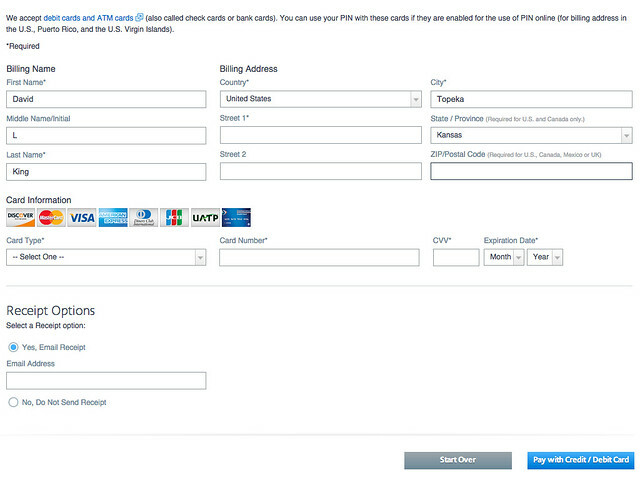 That’s pretty much like no other credit card page ever. And it forcedÂ me to think about the functionality of the page. For example, I really, really wanted to type my middle initial in the Country box, and my last name in the City box. Then, since I’m used to typing left to right, when I reached the Street address box, I couldn’t enter my cityÂ next. I had to search for the City box … because 9 times out of 10, most of usÂ generally type address, city, state, zipcode. Except, apparently, for American Airlines. So instead of thinking about my purchase (paying $15 extra to board in group 1), I was having to think about where to type my middle initial and my city. My point? Don’t ever forceÂ your website visitors to have to think about your website and your poorly-done forms. Keep website visitorsÂ focused and thinking about the things they really want to do (i.e., check out a book! borrow a movie! read your cool blog post! etc). If your website visitorsÂ have to think about how the functionality of your website works … you have failed. Usability. It’s something ALL websites should work on … all the time. For example, check out this AirTran page. I was checking in and printing boarding passes for my daughter, and this page appeared. Directly underneath the “print now” label, there’s a button that says “continue.” The button is big, obvious, the text is bolded, and it’s right underneath the “print now” label. Guess what I did? I clicked “continue.” Which was the wrong thing to do. There’s actually a “print” button there too, to the right of everything. Pushed off to the side, no bolded text, smaller, etc. Do you think AirTran could improve this? Yep. Pretty easily. Now – think about your websites. Is there anything … anything at all … that you could improve pretty simply? Probably so. Go do it.